Bobby Smyrniotis’ track record in player development speaks for itself. The mastermind behind Sigma FC oversaw the early careers of many of Canada’s finest modern footballers. The list of alumni includes Cyle Larin (Besiktas), Richie Laryea (Orlando City), Manjrekar James (FC Midtjylland) and Emery Welshman (FC Cincinnati), among many others who have used the Mississauga-based academy as a platform to elevate their careers. Many of his former players have now returned to Canada to rejoin him at Forge FC in the Canadian Premier League, bringing with them experience across many leagues and footballing environments. It’s an opportunity for Smyrniotis to continue working with players he helped shape in their youth. With a professional league and infrastructure now on offer, Smyrniotis believes he now has the resources to “accelerate player development” on all fronts. 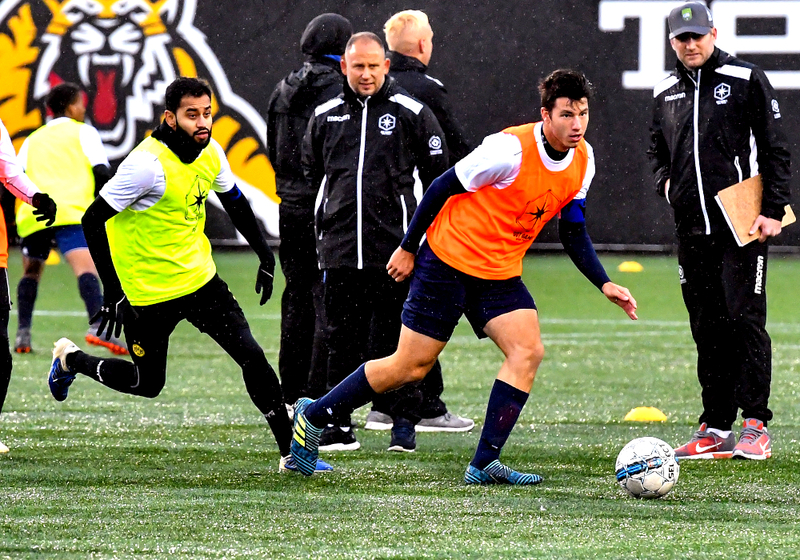 “The great opportunity here is to mould players in a more true aspect – having them go through a full system with a larger infrastructure and better access to facilities,” Smyrniotis told CanPL.ca, when asked what windows of opportunity have opened for him with the CPL. He continued: “Now you really have the pressure of first team, professional football. And, you’re able to take your top talent with you 10 months of the year, playing a top-level of competition that whole time. It’s a welcome change for Smyrniotis, who is used to seeing players split time between U.S. colleges and his program, which he said only works well for “a small percentage” of footballers. The ideal solution, according to Smyrniotis, revolves around consistency of play and, of course, the chance to actually play. He points out that every other country has a domestic showcase for its players, and affirmed that many Canadian talents are naturally overlooked and underrated for reasons beyond their actual talent – such as the lack of media attention or irregular appearances on broadcasts. Perception, Smyrniotis explained, is half the battle. “There are going to be players in this league that many have never heard of or seen that will become stars and move on,” he vowed. “We have had a big drain on talent in the past 10, 15, 20 years. We’ve seen very good players, for various reasons, not have those opportunities. Over my years, I have seen a lot of good young players go on to the next level and a lot of players that, might have even been better, never go anywhere. Smyrniotis has never shied away from putting trust in young players, stating firmly that age is only a number. “If a player is good enough, he’s old enough,” he insisted. Forged in fire, Smyrniotis sees the CPL’s roster rule mandating a cumulative 1,000 minutes for players under the age of 21 as a natural symphony of his own beliefs — not an imposition to work around. The other side of the coin is “getting that extra 10, 15, 20 percent” from his veteran players, which Smyrniotis admitted will be a “big challenge” for him in the jump to the professional level. Underlying all of it is the insistence that talent ought not be hoarded, either. Smyrniotis has watched many a player leave Sigma FC for bigger opportunities elsewhere. It’s part and parcel of running an academy, and an attitude he seems intent to keep at Forge FC. “We want to see some of our best young talents move on at a good age,” he affirmed. “You never want to drain the talent pool from your league but you have to be confident in the flow of players. There is, perhaps, no one in Canada more fit for the task than he.